This weekend marked the return of the awe-inspiring Red Bull Air Races. The first race of 2014 took place in Abu Dhabi, and Hartzell representative, Sam Gascho, was on hand to take in the spectacle. The racers made their qualifying runs on Friday, March 28. Pete McLeod of Canada took the top spot, edging out Britain’s Paul Bonhomme and Nigel Lamb by 0.197 seconds and 0.376 seconds, respectively. In fact, the top six qualifying competitors finished within one second of each other. 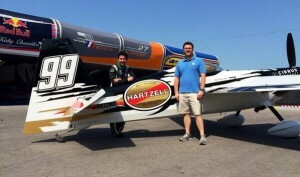 The tighter finishes are a tribute to new rules for the 2014 Air Races, which standardized the aircraft’s powerhouses and supplied each racer with Hartzell’s high performance composite propellers and light-weight governors. Saturday’s head-to-head heats were won by Nicholas Ivanoff, Matt Hall, Hannes Arch, Nigel Lamb, Paul Bonhomme, and Pete McLeod. Arch put up day’s the best time: 00:57.978. Michael Goulian, a favorite for everyone here at Hartzell, suffered engine trouble prior to the race and was forced to bow out. After another round of races, the final match pit Bonhomme against Arch, McLeod and Hall. Bonhomme won the day with a record-setting time of 00:56.439, proving his skill and showing the world that the newly standardized equipment is not only safer, it is also the apex of performance aircraft technology. Congratulations to all the racers. Watching you push the limits of aviation gives us the spark to continue innovating. To Sam, our representative in Abu Dhabi, have a safe flight home. The next race is scheduled for April 12-13 in beautiful Rovinj, Croatia. Check back for photos, videos and highlights from the world’s fastest and most exhilarating motorsport.